To help you get ready for traveling with your photography gear this summer, my friends at Think Tank Photo have announced two fun promotions. Free Shipping! – For the month of May all orders placed on their website or by phone will be shipped for free, with no minimum order amount. 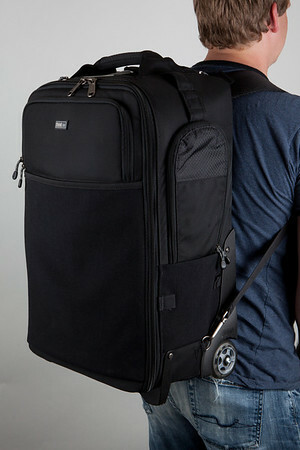 Free 15” Laptop Bag with every order of their popular Airport Rolling Camera Bags! Think Tank’s rolling camera bags are renowned for their durability, security systems, and sizing so that they can be carried on board airlines, as opposed to you having to check your valuable gear at the gate. Sizes range from the Airport Security, which fits on board domestic flights and holds a 600mm lens unmounted or a 500 f/4, 400 f/2.8 and smaller lenses mounted to a pro-size camera body, to the Airport TakeOff combination roller and backpack, which fits on international and domestic flights and holds up to 400 f/2.8 and other assorted lenses or two pro or regular size DSLR bodies with or without lenses attached. Read my reviews in the links below to see that the Airport series bags are some of my favorites. The Airport Security bag shown at the top of this article is my most frequently used big bag and the one I took to Asia for over two weeks last year. I LOVE IT! Click here for a list of eligible products, and click here for my general Think Tank Photo special offer.